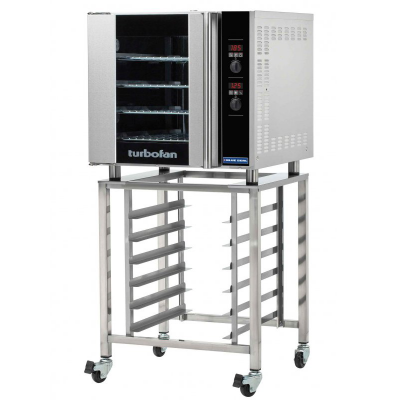 Whether you are looking for catering oven hire or domestic oven hire, our Blue Seal Turbofan Electric Convection Ovens complete with stand is the perfect choice. The oven takes 4 x 1/1 Gastronorm Trays at any one time and the mobile stand complete with 4 locking wheels allows you to store 6 1/1 gastronorm trays. Ideal for a temporary event kitchen, in a marquee for a wedding or an outdoor festival, even use it as an extra oven for your Christmas turkey. Click the link to download operating instructions: Turbo Oven Operating Instructions. Please ensure you read before using.